This newspaper hopes that today’s sitting of Parliament will not cover old ground, as has happened so often in the past. But the questions tabled by PAP MPs — on the spate of high-profile scandals involving government officers — don’t give us much confidence because they revolve round the same old theme of trust. The PM and his deputy have already issued statement after statement on that. WHY did it take the case of the CPIB officer, who was hauled to court for allegedly siphoning $1.7 million, four years to uncover? WHY are scandals like this cropping up with such regularity? ARE there any flaws in the government’s check-and-balance system? It is strange that the PM has to elaborate on why S R Nathan was given the top award for this year’s National Day. 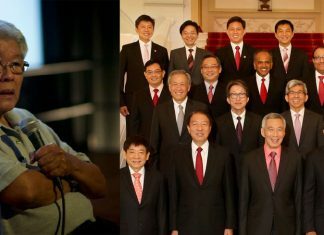 Everything that Lee Hsien Loong said on Friday was a repeat of what was mentioned when the honour was announced. So why? The only reason we can think of is that some questions must have been raised about the choice of Nathan. HIS offer to be the hostage during the 1974 Laju hijack. HIS appearance as ambassador to Washington on the Larry King Live TV show to defend Singapore’s decision to cane American teenager Michael Fay for vandalism in 1994. And with the world’s spotlight zeroing in on this little red dot. A Straits Times report on the launch of Lee Kuan Yew’s latest book had this intriguing sentence: He was not assisted to his seat. Maybe ST wanted to show that Lee was still sprightly. Maybe it was told to do so. The bigger worry is if it was the former because it shows an institution, which has a longer history than the PAP government, stuck in the mud of old habits. Acting Manpower Minister Tan Chuan-Jin made an important point but, oh, but what a throwaway line it was. In an interview with The Straits Times he spoke of his encounter with a “landed property resident who was quite established, working in an important establishment”. What are you doing for people like me, she asked him. Well, minister, welcome to the new world of entitlement where the rich are not shy to ask for more while their poor cousins are toiling away, some even suffering. Now, how to even start talking about philanthropy? A new book co-authored by Google executive chairman Eric Schmidt says Singapore is a good case study on political pressures and technological challenges. “Even in as tighly controlled a space as Singapore, government restrictions and social codes have limited leverage in the online world,” the book says. PM Lee Hsien Loong is interviewed in the book, The New Digital Age: Reshaping The Future of People, Nations and Business. But his quotes — like “the danger we face in future is that it will be far easier to be against something than for it” — just shows how the government has yet to come to grips with this transformative medium. Our advice: start by liking it, the rest should follow.